Description	 DUE TO STOP RACING - CLEARANCE - USED ONLY ONCE - beautiful dress by atelier SAPIEL - unique model - orange red colour - sz. 40-42 (ITALIAN) height from 165 cm to 170 cm. decorated with original svarowsky - - underskirt is fucsia. Payed 2,200 euro on august 2016. 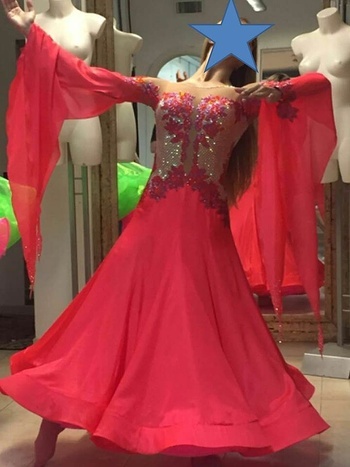 I sell the dress because I must stop dance. The dress is washed and restored (some little swarovsky to stick on). The dress is really perfect! Necklace, earrings, new white Sapiel kimono (never used) and Sapiel bag included . MEASURES of the dancer are: - BREAST CM. 88 - WAIST CM. 67-68 - HIPS CM. 90 - HEIGHT CM. 167 withouth shoes Please write me for others informations or photos. It's possible to correct the dress for your figure directly in Sapiel atelier in Italy - write me to receive other images - the dress is ready for shipment. Send me your best offer. I will carefully consider it. It's a shame have it in a closet. ITALIANO: PER ABBANDONO COMPETIZIONI - SVENDO - bellissimo abito dell'Atelier Sapiel - taglia. 40 - 42 modello unico - colore rosso arancio - decorato con swarovski originali - ampia scollatura sul retro - gonna a 8 teli con sottogonna fucsia - USATO PER UNA SOLA GARA - pagato euro 2.200,00 - gia' lavato da Sapiel e pronto per la spedizione - possibilità di adattarlo alle vostre misure direttamente presso l'atelier Sapiel - scrivetemi per altre foto o video - spedizione con corriere espresso DHL. Mandatemi la vostra offerta e la considererò attentamente. è un peccato tenerlo chiuso in un armadio.